After weeks on the road I came back to find your book and also to read it. You have every reason to be very proud of your father. He was truly in the thick of battle during the war and he served his country with distinction--showing a natural human response to the destruction and loss of life. Thank you for the book and I wish you luck in your efforts to promote it. I look forward to reading your book some day soon. Thanks for being so patriotic and such a great American. I know you must be so very proud of your father and what he did for our great nation. I am very proud of him and all Veterans for my freedom and the bravery they displayed just by serving. I hope you sell a million copies and more! served in the 101st Airborne Division during World War II. more terrible things than he actually did. I love the tone of this American man, and appreciate it with a full heart knowing how many callous men are out in the world and do not know how to be gentlemen. For that is what David Tharp is, a warrior gentleman, a true knight not only for his country but for the woman he loved. romantic, even if a couple of letters are to others than Tharp's future wife. I sat back, astounded by the strength of my feelings. I am very proud of David Tharp and grateful to his daughter for having saved this record of such an American. He is the kind of man I would like to say symbolizes this great nation although clearly in his lack of discrimination, and in his ability to analyze, he stood out as superior. Reference: Your Face book posting on October 5, 2013, "SERVED WITH THE 82ND AND 101ST AIRBORNE AND PROUD OF IT! What a beautiful tribute! 3 guys who held your hand, held your heart, and continue to inspire you to do all of the wonderful things that you do. With my father, he never had the anger part but he tried very hard to drink it all away. Much respect for you Jenny. I read what was on your website and I was blown away. Thank you for your family's service to this country. I am going to buy a copy of the book just as soon as I am able. You are to be congratulated on this effort on behalf of your father. A very heart felt reminder of what our past generation went through during WWll. An intimate peek of love put on hold with all the sadness and joy of waiting for life to return to normal. A must read for anyone who had family or friends who served during this time in our history. It makes our difficulties of today seem small compared to what our nation youth suffered for our generation. It makes you want to thank every service person you see in uniform today. I ran across Jenny La Sala's book, 'Comes a Soldier's Whisper' while doing some follow up research on my late father and his service as a Screaming Eagle of the 502 PIR of the 101st Airborne during WWII. This book has touched home with us! Her late father and mine were in the same regiment but different companies. I read some of Jenny's postings on Triggertime.com, which is a web site dedicated to the 101st Airborne Division. I ordered the book from Amazon and my wife was home when it was delivered and read it first. She did not put it down until she was finished and told me how touched she was reading David Tharp's letters to his then sweetheart. The same thing happened to me when I starting reading the book, I could not stop reading until I was finished! Knowing that Jenny's father and my father were most likely at the same places at the same time when some of these letters were being written made them even more special. Bravo to the author for writing this book! Greetings from TC over here in Normandy. I got a copy of your book and found it most powerful. Jenny really enjoyed your book ...very moving letters home. Those were some letters written home by your father. A most different and refreshing effort on your part, the letters say so much about the Kind of man your father was. Thanks so much for sharing these treasured letters with us. Hope one day you might come to a Trigger Time reunion if your schedule will allow....there is one in August....your more than welcomed to attend. Spent my last free day riding around the various 101st sites here in Normandy.....they provoke some power emotions for sure. I would take every holiday in Normandy if I could. You book is top notch, sure hope we I have a chance to meet you in person one day. Hope all is well in your world.....TC will soon have his usual barrage on photos on Marks Bando's site. A Salute to you And your father from Tom Colones. TC ! 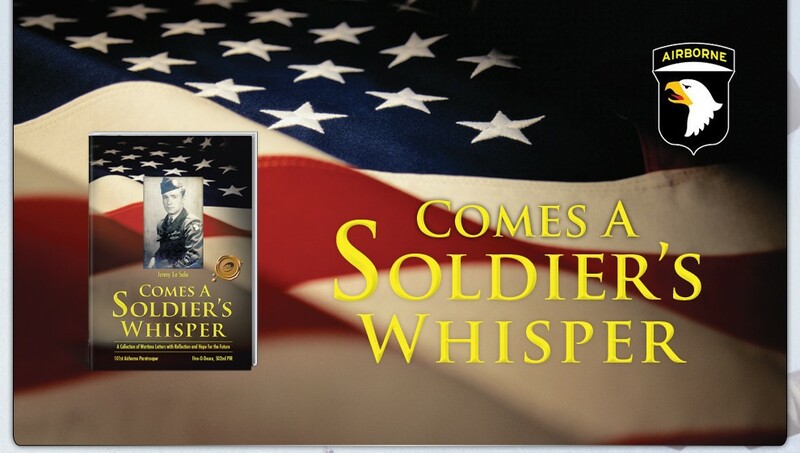 I believe Dad is proud to see how his memoir in Comes A Soldier's Whisper is helping our veterans of today. I had the pleasure of meeting several veterans with the 187th Airborne Regimental Combat Team (Rakkasan) at their annual picnic on June 8, 2013 at Himrod, New York AND Robert Harle of the 101st Airborne, Five-O-Deuce who shared England barracks with Dad and fought in Battle of the Bulge together. He fondly remembered Dad as a soft spoken, handsome and very tall man, unlike some other rough, "tough cookies" they had in the soldier mix. Bob went on to say that when you saw your fellow comrades killed, you didn't hesitate. But there were some who went over the edge and continued after a soldier was already gone. He recalled an incident where a young German soldier was already passed away when they kept tearing at his uniform and ripped off a flower from his lapel, the country flower, Eidelweiss. Bob waited and went back to place the Edelweiss flower back onto the soldier's lapel. Such a loving gesture amidst the horrors of war speaks accolades of human kindness and is a tribute to this very special man. I remember my mom had a hatbox full of letters from her fiancé. He was killed while training to learn to fly in WWII. We used to look at the letters as kids with curiousity, never really realizing the loss and angst they represented. My mom wouldn't talk about it much.